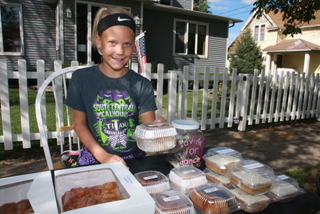 While some kids run lemonade stands, Tori Ellis, 11, sells homemade caramel rolls, pumpkins bars and more from a food stand in her family’s front yard along Main Street in Lake City. 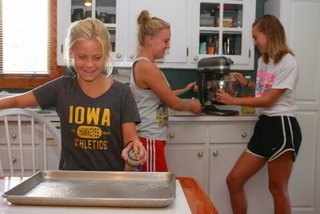 As she and her older sisters Aspen and Payton earn money for dance classes and dance competitions, they’re also learning the fine points of baking, using recipes passed on from their great-grandmother and grandmother. “You k now it’s always good if you make it yourself,” said Aspen Ellis, 18, who is a senior at South Central Calhoun High School and reporter for the local FFA chapter. “We take many of the things we make to the field at harvest or to the crew at our family’s hog barns,” said Dannette Ellis, whose girls get inspired by cooking shows like “Cake Boss” and “Good Eats” on TV. Experimenting with new recipes is especially fun for Toi Ellis, who has sold homemade treats since she was seven years old. She’s glad her family bakes caramel rolls about every other week, since she has been known to sell 15 dozen in only three or four hours. “Baking makes the house smell like fall,” she said. Combine all ingredients. Bake in an 11-inch by 17-inch jellyroll pan for 20 minutes at 350 degrees. 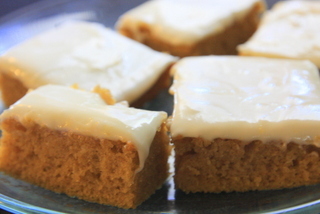 Frost with cream cheese frosting of your choice. Don’t want to make caramel rolls? This recipe can also be used to make dinner rolls. 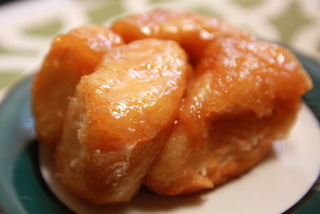 Just don’t dip the knots of dough in a cinnamon-sugar mixture, and skip the caramel sauce. Mix together sugar, eggs, shortening, salt and mashed potatoes. (The Ellis family uses their large stand mixer for this process.) Set mixture aside. Mix together 1 cup water, 1 teaspoon sugar and yeast in a glass bowl. Let mixture rise about 15 minutes. Begin adding flour and water to mixture of sugar, eggs, shortening, salt and mashed potatoes. Add flour (a large spoonful at a time) and alternate with the 5 cups of warm water. Keep mixing and adding flour and water. When about half the water has been added to the dough, add the yeast water mixture. Continue to add flour and water until the water is gone and the dough begins to form a ball. Turn the dough onto a floured surface. Knead the dough until it’s nice and smooth. Divide dough into two balls; place each one into large bowls that have been lightly greased with oil. Then cover each bowl with a damp towel. Place bowls of dough in the warmest part of the house to let dough rise until it has doubled in size. Punch dough down. Cover bowls with a damp towel again. Let dough double in size once again. In a bowl, combine the sugar and cinnamon. Melt butter or margarine in a separate bowl. Punch down dough. Take a handful of dough and roll on the countertop. Form a strip of dough; then dip into the margarine and then into the cinnamon sugar. Tie dough into a knot. Place each knot on top of the caramel in the pan. Continue until dough is gone. Bake each pan of rolls about 25 minutes, or until rolls are dark brown. The rolls need to be fairly dark on top in order for the middles of the rolls to bake properly. Cover rolls halfway through baking so the tops don’t get too dark. When baking is complete, let the rolls cool on the counter for about 2 minutes. Put tinfoil on top and flip pan over to invert. The pan should come off with no problem. Let rolls cool. Store in air-tight plastic containers. Makes 5 to 6 dozen rolls. Combine all ingredients in a sauce pan. Cook 1 minute, and then stir. Then cook 1 more minute. Pour mixture in bottoms of 9-inch by 13-inch pans. A mixture of shortening and butter help these cookies achieve the right shape and texture when baking. Using a mixer, combine all ingredients except chocolate chips. Stir in chocolate chips by hand. Chill dough in refrigerator for 1 hour. Scoop out balls of dough onto baking stone or pan. Bake about 12 minutes at 350 degrees, or until cookies are nicely browned. Store cookies in air-tight container. These cookies freeze well, too. Almond extract adds a special flavor to these cookies, which work best when they are rolled out thin and are not overbaked. Cream margarine, powdered sugar, egg, vanilla and almond extract together until smooth. Add dry ingredients until well blended. Chill dough at least two hours, or overnight. Roll out dough on a floured surface to desired thickness. Cut dough with cookie cutters of your choice. Bake cookies on greased cookie sheet or baking stone at 350 degrees until bottoms and sides of cookies start to brown. Frost when cool. Combine all ingredients together. Frost cookies, as desired. This takes great on a crisp fall day with a warm cup of coffee. For the first layer, combine walnuts, flour and margarine. Pat mixture into the bottom of a 9-inch by 13-inch pan. Bake 10 minutes at 375 degrees, and cool completely. For the second layer, cream together 1 cup whipped topping, powdered sugar and cream cheese. Mix well. Spread over first layer in pan; chill. For the third layer, combine pudding mixes and milk. Beat until thick. Pour pudding over second layer in pan; chill. For the fourth layer, spread the remaining whipped topping over the third layer. Garnish with chopped walnuts. Refrigerate. The Ellis family likes to serve this hearty stroganoff over mashed potatoes and cooked noodles. Brown ground beef in skillet. Drain fat. Add onion, garlic, beef bouillon, and seasonings. Cook until browned. Add cream of mushroom soup and milk. Cook for 5 minutes. When ready to serve, add sour cream. I originally wrote this article for Farm News, Ft. Dodge, Iowa. It looks delicious. Wish I lived closer to sample! Question, what temperature is oven to bake the Caramel Rolls?